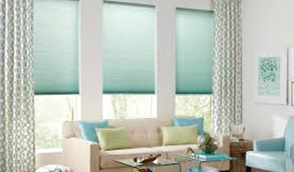 Honeycomb shades are insulating cellular window shades that come in different kinds of fabric and different types of shades, which is folded into a large number of honeycomb-like cells. Any homeowner who is looking for a sophisticated interior can go for honeycomb shades. The best part about these shades is their versatility. The insulating property of these shades allows you to keep your house cool during summers and warm during winters. They come with a top-down or bottom-up feature that increases the privacy of your home. They come in light-filtering translucent or light-blocking opaque fabric, which gives you better control over the light entering your room. The cordless mechanism is best if you have children in the house. They are not the most stylish and fashionable window treatment option available to homeowners. Some of them have the look of creased paper, which doesn’t always look great. You cannot tilt vanes if you have honeycomb shades. 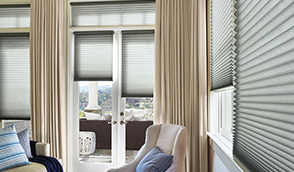 Although honeycomb shades come in different shapes, sometimes they are required to be kept closed, thus making them less versatile an option for window treatments. 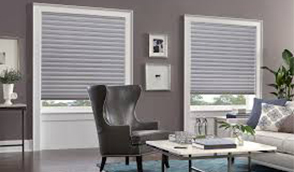 Contact DC Shutters for High Quality Honeycomb Shades in Brampton, Toronto, Oshawa, Oakville, Kitchener, Waterloo, Hamilton, Niagara, Toronto, Richmond Hill, Aurora, Newmarket, Ajax, Whitby, ON.